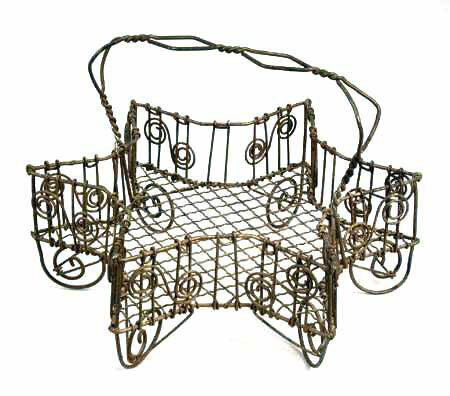 While things made of wire tended to be thrown away without a thought when they rusted after loyal service in the kitchen, wine cellar, laundry, or garden we are very glad this wonderful Star Shaped Basket did not suffer that fate. As a craft, wire working (which began in 17th Century Slovakia) developed into a trade and Tinkers were recognized as a bona fide profession. As a craft, wire working reached its height at the turn of the century when ten thousand tinkers were working in Europe and America. New technological advances in metalwork allowed the most talented among the craftsmen to express themselves in an artistic manner that had little to do with the utilitarian objects that had been their original stock-in-trade . . . eggbeaters, potato mashers, salad spinners, baskets and trays, and Victorian bird cages to name a few. I constantly marvel at the variety of practical imaginative and charming forms a material so plain can take in the hands of a skilled craftsman. 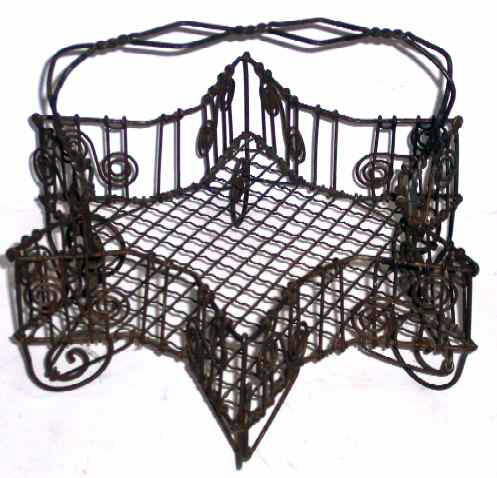 This wonderful Star Shaped Wire Basket made of tinned wire with applied scrolled decoration is an exceptional example of the work of the Tinker whose skill and romance were immortalized by the famous Austrian composer Franz Lehar in his 1902 operetta Der Rastelbinder (The Tinker). The form is fabulous as is the design. It is an excellent example of a utilitarian item elevated to Folk Art and deserves to be recognized as such . . . whether part of a collection of which it would be a stellar example or as a stand alone piece to be admired and yes, perhaps used once again. While much of this wire-ware was made in France it also was made circa 1872-1876 by Woods and Sherwood Company of Lowell, Massachusetts. Listen closely . . . do you hear "croissant" or "bagle" being spoken? The Star Basket is 11-1/2" from point to point and 8" high to the top of the diamond shaped handle.